Awake & Moving: Photoshop Acquires Kyle T. Brushes with A Massive Update. Photoshop Acquires Kyle T. Brushes with A Massive Update. Technically, still a WIP, but overall just about done. In the summer of 2016 I purchased some pretty amazing digital brush sets for use in Photoshop from Kyle T. Webster, an award-winning illustrator and arguably the top gun in digital brush creators. Thanks to my buddy Sven who put me on game a while back, I was blown away with the tools I bought that are awesome in quality, super inexpensive, and also easy to use. A combination that doesn't happen often in any field. Fast forward to today where Adobe has acquired KyleBrush.com, bringing Kyle along as part of the Adobe team. This is HUUUUUGE! Working directly with Adobe is going to open up an entirely new realm of possibilities for Kyle and his digital brush creations and I am stoked to see where this goes. Adobe is always changing the game and expanding what we can do as creators, so I know this acquisition is going to be monumental. This new venture also includes these brushes as part of your Adobe CC subscription. You're welcome. The image above was created using a hand drawn image I inked and then imported into Photoshop. From here I blocked some flat colors out and then laid my textures down through a mix of Kyle's brushes, some stuff from True Grit Texture Supply (a phenomenal set of tools for any digital artist), and some other Photoshop techniques I've learned and taught myself over the years. 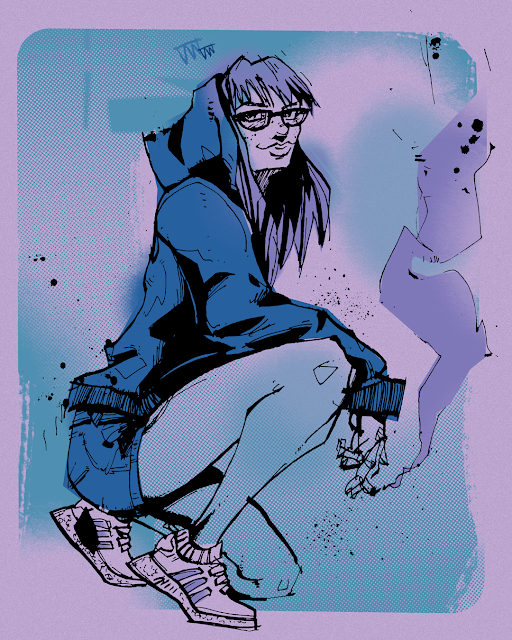 I found an old sticker of one of Ashley Wood's pieces that I used for inspiration in colors, trying to limit my color palette more than I normally do. This brought a new challenge to my digital colors and presented an experimental piece in the process. Mixing techniques and tools in search of harmony is no easy task, but I am happy how this one turned out. I created three colorways with a slight 3-D effect on the inks that can be seen on the Awake & Moving Instagram, @awakeandmoving. I want to add type to this as well, so we'll see how the finished piece pans out. To all my digital creators, please check out these brushes once they start rolling out in Adobe CC, I guarantee you'll love them.